I have some camping planned for later this summer, so I bought a woolen blanket from Adam Henzl at https://handwovenwool.com/ It was probably woven in the Achaemenid empire, and the price was similar to a 100% wool blanket from sellers of Heimtextilien in Innsbruck. The wool is soft and well-woven with strong selvages. When I spread it over my lap and worked it, I found it very educational. As you can see, the wool still contained a significant amount of burrs, grasses, wood chips and windblown debris. Much of this was not easily visible but appeared under my hands and my tweezers. Many people have an idea that things which are early or handmade must be rough and crude. In fact, people who have examined ancient textiles usually gush about the slender threads, intricate patterns or embroidery, and strong fibres. As far as I can tell, the last 2000 years of the history of the textile industry is the history of gradually adopting new techniques which are a little bit worse but noticeably cheaper. People in agrarian societies often have more time on their hands than work: there are more people on the land than are needed to work it except in harvest season, there are not enough towns or merchants putting out work to give them cash jobs, so there is time for slow work like spinning on a spindle or terracing hillsides. On the other hand, distinctions between simple work from the country and refined work from the market are as old as the bronze age. Without metal combs, powerful soaps, and running water, cleaning wool is an immense amount of work, and a peasant’s cottage is not a clean room. 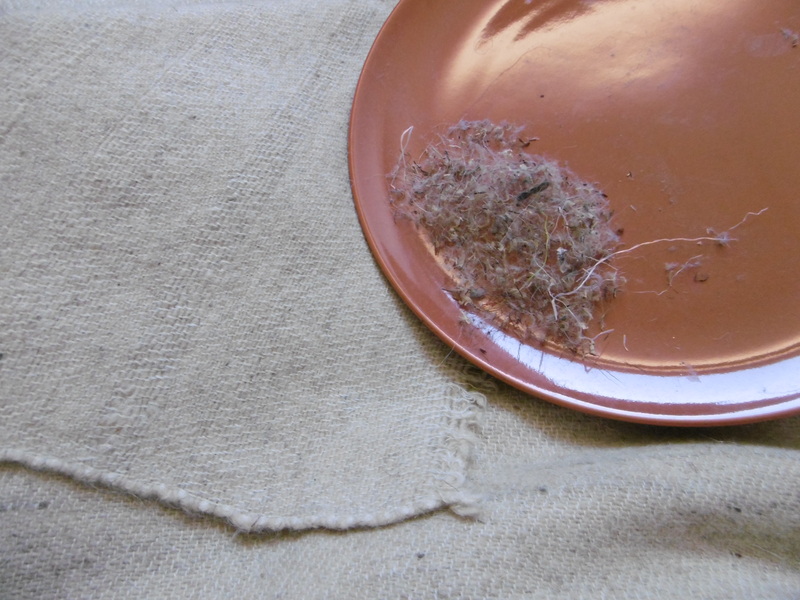 So I suspect that some historical wool threads had leftover vegetable matter in them. Burrs and other debris is also something which I have never seen discussed in archaeological publications. They often discuss thread counts, chemical analyses of dyestuffs, and Z-spun vs. S-spun threads at length but somehow leave out weight and the presence or absence of vegetable matter. By focussing on what is easy to measure (or what other books decided to record, so must be important even if they can’t explain why) they leave out some other important things. The blanket cost 50 or 60 Euros, and removing the excess vegetable matter took a few hours. There are plenty of other ways of spending that amount of time and money which are not as educational. If you are interested, Adam Henzl still sells a variety of blankets, lengths of cloth, and narrow weaves through his own website and Etsy. Fulling: that is, cleaning wool and altering the nature of the woven product, was one of the worst medieval jobs. Fullers could earn 3 times as much as a field hand because the work was so unpleasant. Fullers Earth (Alum) and other chemicals were used in what was a sort of felting process. Sometimes I would like to learn more about ancient woolen textiles. You hear that the Celts invented soap, and about Vespatian’s tax on the money from selling urine to fullers, but I do not know what kinds of textiles they fulled and what kinds they left with the weave visible. Christian Cameron’s group in Toronto was researching Greek textiles, but then they deleted their website.